Bryan Roberts, assistant dean of student services, sits at his desk Monday. Roberts is helping the college move course override forms online. The initiative is a joint effort from the Office of the Provost, Information Technology Services and the Park School of Communications. It is part of the college’s Homer Workflow Implementation Group project, which aims to put about 40 of the most heavily used forms online. Bryan Roberts, assistant dean for student services at the Park School, said feedback has been positive so far. The form is available on the Park School website and requires a Netpass username and password. The link is only available once the time ticket for registration commences. If the request is approved, students will receive an email, and they will be able to register for the class. The online override request form will be available to students in other schools for Spring 2014 registration, depending on feedback from registration for next semester. Roberts said the college decided to begin using the system with the Park School for two reasons. Bill Liddick, associate director for enterprise solution development at the college, said he believes that this new online request form will appeal to students from every school. At a session for Park School students April 5, Roberts demonstrated how to fill out and submit a course override form online, and a tutorial was sent out to all Park students who were unable to attend the meeting. Many students who attended the event questioned the simplicity of the form. However, most seemed to prefer the online method to that of the current paper option. Freshman Emily Morley is an exploratory student who will be transferring into the Park School. Morley, who has used the online form to register for Park School classes, said the online system was more efficient than the paper-based one. Liddick also said the goal for the online request form will also help the college save paper. Before the online request form, there were several paper-based forms that students had to fill out to request course registration. 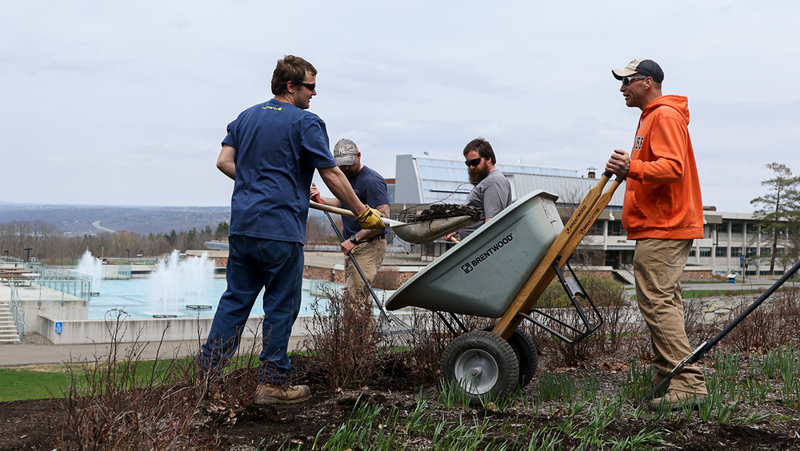 Ithaca College has a Comprehensive Environmental Policy that lays out steps for the Efficient Use and Conservation of Energy, Water and Other Resources. Marian Brown, special assistant of campus and community sustainability, is a part of this plan. Brown said she believes that this online document processing will save time and money by eliminating the costs to print the forms. She said it will also improve the efficiency of the document-processing step. “Transitioning to online forms reduces the need for harvesting additional trees for paper pulp and significant water saving from paper production, so there is an environmental benefit,” she said. However, Brown said, while there are environmental costs to provide the electricity for computers to run the servers, the environmental benefits of reduced paper use would outweigh the costs. “Having simple, relatively low-value activities like course registration done more quickly and efficiently benefits students by freeing their time to do more important things, like study,” Brown said. Looking toward the future, Roberts said he expects everyone will benefit from the new online system. Assistant News Editor Noreyana Fernando contributed reporting to this article.